The poor quality of water, as well as its restricted supply and availability, is one of the biggest challenges of our time, with presently two-fifth's of the world's population unable to find adequate fresh water for essential usage. Over 40 years' research has been carried out on the positive effects that rhythms and specific water flow has on water's capacity to support life. 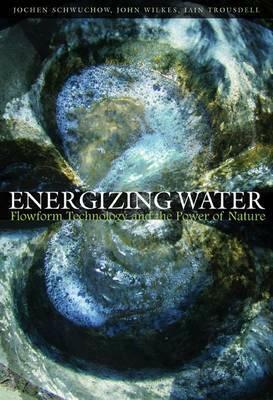 Energizing Water presents this cutting-edge research to the general and professional reader at a time when interest in finding solutions to water's huge worldwide problems is growing rapidly. Three aspects determine water quality: its chemical constituents (including its oxygen levels); its organic aspects (with the danger of contamination by effluent, pathogens and algae); and its 'energetic' nature. The latter facet has been recognized from time immemorial by traditional societies, who have developed their own sciences in relation to water quality, using terms such as prana and chi for energy. Now, through the introduction of quantum physics into the life sciences, modern science is beginning to accept this concept, measuring energy as light emission. Research into energetic water quality - and particularly into the creation of moulded surfaces that support biological purification of the chemical and organic elements, as well as enlivening the energetic attributes - goes back to George Adams' and John Wilkes' pioneering work in the 1960s. The invention of Flowform technology in 1970 carried this research further, providing the world with one of the first modern-day, biomimicry eco-technologies. This creative technology applies nature's best methods to produce extraordinary results, and this book outlines the background story on research and application of the Flowform method today. JOHN WILKES originated the Flowform Method in 1970 following periods of work with George Adams and Theodor Schwenk. After further research, project work led to installations in many countries. In 2002 an Institute was built at Emerson College providing more adequate space for research into the qualitative effects of rhythmic movement on water. JOCHEN SCHWUCHOW is a freelance research and teaching consultant at Emerson College in England. IAIN TROUSDELL is director of the Healing Water Institute in NZ.